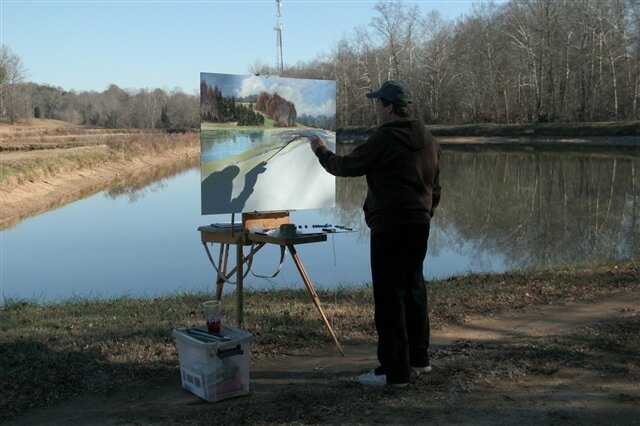 Craig painting en plein air. Craig has a deep love for the outdoors, spending much of his free time climbing, paddling and hiking. This love is reflected in the essence of his paintings and sculptures. His paintings are primarily in oils, reflecting a variety of styles. His sculptures combine the feel of the natural world coupled with sparks of modern elements. Craig is also a teaching artist. He teaches numerous classes and workshops throughout the Piedmont. He is the founding member of Triad Outdoor Painters, a group of local artists who paint together in the NC Piedmont and Foothills since 2010. He is also the Vice President of Muddy River Art Association. Craig lives in Winston-Salem, NC with his beautiful wife Amy and sweet dog Sidney. ©Craig Richards, Ready to Go. Oil on panel, 9 X 12 inches. ©Craig Richards, Price Lake. Oil on panel, 16 X 20 inches. ©Craig Richards, Smoke on the Water. Oil on panel 20 X 30 inches.